Apple's decision to enter digital payments marks a pivotal moment for the industry and reflects the scale of opportunity that exists in digital payments today. Today we have a generation of consumers who expect to live, consume and pay in ways very different to their parents and grandparents and this move from Apple reflects this changing demand. So what does Apple Pay actually mean for owners of the new iPhone 6, iPhone 6 Plus and Apple Watch? Ultimately, it enables users to make purchases in store without taking out a card or cash. To add a card, users can simply take a picture of their card to add it to their Passbook – the details of which are never shared with the merchant. Each device contains a wireless NFC chip allowing users to tap their iPhones on a contactless terminal to make a payment. This is a very exciting milestone and we're very proud to be a partner. NFC, however, isn't new by any means. Many other devices support NFC and Visa Europe has been leading the rollout of NFC enabled payments ever since we launched the first contactless cards and terminals back in in 2007. In fact, today there are more than 1.5 million Visa contactless terminals in stores across Europe – all ready to take mobile payments. That being said the implications of Apple Pay are very important. Apple is a critical piece of the mobile payments jigsaw: the company's support will – and already has started to - drive further awareness of contactless services around the world. As with any technology, consumer adoption is far from instantaneous. Most technologies go through an adoption cycle that lasts anywhere between 10 and 20 years. There are barriers along the way and this is something we're watching unfold at the moment as digital payments (contactless cards, digital wallets and mobile payments) move into the mainstream. 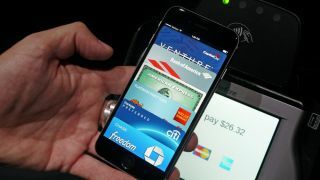 That's exactly why Apple's move marks an important turning point in the mobile payments story. We anticipate a "halo effect" will occur that will benefit all players in the mobile payments ecosystem as consumers become increasingly familiar with these new ways to pay. Visa Europe's stance has been to back all digital payment offers that give the consumer choice, convenience and security so people can pick the payment method that best suits their time, place, device and personal preferences. In the not too distant future, cash will become a thing of the past as people of all ages will choose to pay digitally thanks to the security and convenience it offers. When that happens we will look back to September 9, 2014 as the day mobile payments became mainstream. Note that Visa won't be bringing Apple Pay to the UK until sometime in 2015.